We decided to visit England for our antepenultimate coaster expedition this year, primarily so that we could experience the recently rebuilt Scenic Railway at Dreamland. Our itinerary for the rest of the weekend was filled out with small coasters that were either close to our routing or new to both of us. Poor weather and bad luck caused us to miss out on four of the eleven coasters we'd hoped for, and an unexpected twelfth discovery was closed, but despite those minor embuggerances we very much enjoyed ourselves, proving once again that small and family-owned parks suit us far better than the large corporates. Our first stop today was at Brighton Pier, which I'd not been to since 2005. Satnav suggested that it was only about a ten minute diversion from our planned routing, though heavy traffic courtesy of the Brighton Breeze tripled that estimate. It was an entertaining delay, however, as we watched enormous numbers of antique Volkswagens pass us by, most owned by members of the Split Screen Van Club (yes, really). Sadly our visit proved to be a complete write-off; storm force winds on the sea front meant that both coasters and most of the flat rides were out of service, and though the Horror Hotel was open we decided that we didn't feel like spending £5 apiece to experience it; with luck it'll still be there on our next visit when we'll probably go with unlimited ride wristbands. We had no idea what to expect with Flamingo Park, a small seaside facility located beside the beach in Hastings. The web site carried a prominent notice saying that the park was open daily from 11:00am, but it was difficult to believe that when coupled with a copyright date of 2012 and a linked Facebook page that hadn't been updated since 2014. The light rain that was falling as we approached made things seem even less promising, and we were right on the verge of concluding that this would be another failure when Megan spotted a moving coaster train. The second classic car event in as many hours was taking place in the area, but there were still a handful of spaces available in a parking lot three hundred metres to the east next to a model railway. The short walk from there took us past a whole series of fishmongers and boating sheds that were idle today presumably due to the conditions. Similarly there were only a handful of people in the park, but it quickly became apparent that all the rides were attended, and with that in mind we went for a quick walk to ascertain the lay of the land before buying tickets. Two minutes later we'd confirmed our targets; the Haunted House and the the roller coaster. Caterpillar (#2388) is one of (at least) three standard layout Big Apples to have operated at the park over the years. An authentic Pinfari MB28 was present until the end of 2011, followed by a more elaborate travelling model of indeterminate provenance that we caught up with in Dubai a few years ago. The current version was produced by Turkish manufacturer Levent Lunapark, and it remains as of this writing the only installation of its type in the United Kingdom. The operators on duty today were hilariously exuberant, shouting out "hands in the air, it's the big drop!" each time the train approached. Better yet, the descent wasn't braked in any meaningful way, making for an unusually forceful turn back into the station. There were two bench cars on the Haunted House that looked very old indeed. There wasn't enough leg room for me to sit in the front, but there was ample space in the back. The first section of the ride was in complete blackness, with nothing to see other than a few strings hanging from the ceiling. Things quickly improved however, with a good collection of well-presented scenery including a mannequin in an electric chair and another with a remarkably prehensile neck. One particularly frightening specimen was labelled (not inaccurately) as the mother-in-law, reminding me of an old joke: What is the difference between in-laws and outlaws? Outlaws are wanted! Though it wasn't available to ride today we spent some time admiring a fenced-off powered coaster of indeterminate provenance that was previously unknown to the community. 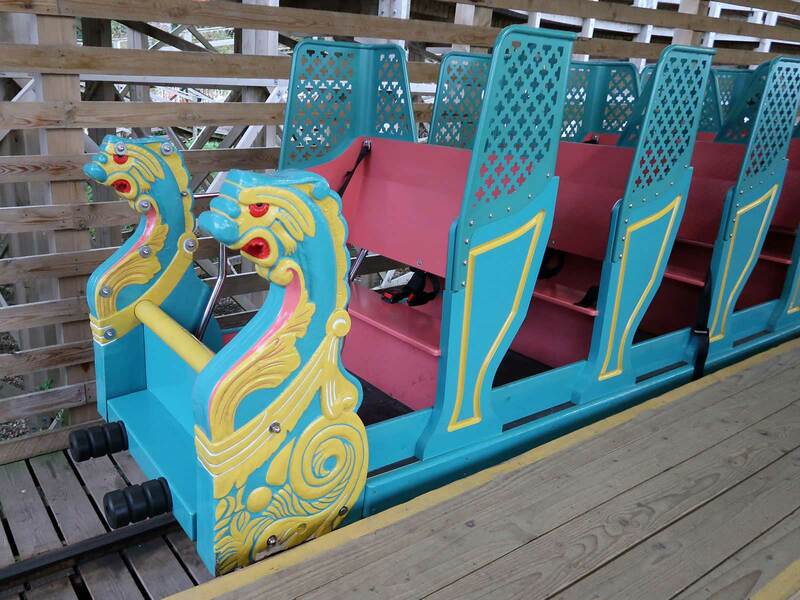 Speed Coaster features a two-car Wacky Worm train that negotiates roughly one hundred feet of oval-shaped track. Despite its obvious simplicity the ride has apparently been under construction since the early part of the summer; one presumes that an unexpected technical problem has delayed its opening to the public. Whether we would have fit in the seats or not is open to debate, but it would certainly have been interesting to try! My first trip to Dreamland took place back in 2002 as the last-but-one stop on a ten day tour with the American Coaster Enthusiasts. Though I didn't realise it at the time the park was beginning to decline; the Looping Star was removed at the end of that year, followed by the Blue Coaster in 2003 and the Wild Mouse in 2004. The rest of the park struggled on for a final season but eventually closed at the end of 2005. Nearly all of the site was cleared for redevelopment, but the Scenic Railway survived thanks to the hard work of a number of enthusiasts who managed to get it Grade II* listed building status. The owner of the land did his best to challenge this, and an arson attack in April 2008 destroyed a sizeable percentage of the ride including both of the original trains. Despite these setbacks however the local authorities held firm, and in 2012 the land was acquired by the Dreamland Trust, a registered charity set up with the sole aim of restoring the park. Legal argument resulted in a two year delay before actual construction work could begin, but in due course the proverbial dust settled and local contractors began putting a reimagined park together. The centrepiece of the project was always going to be a rebuilt Scenic Railway, and WGH Transportation was brought in to make that happen with the assistance of Fairfield Control Systems and Topbond. 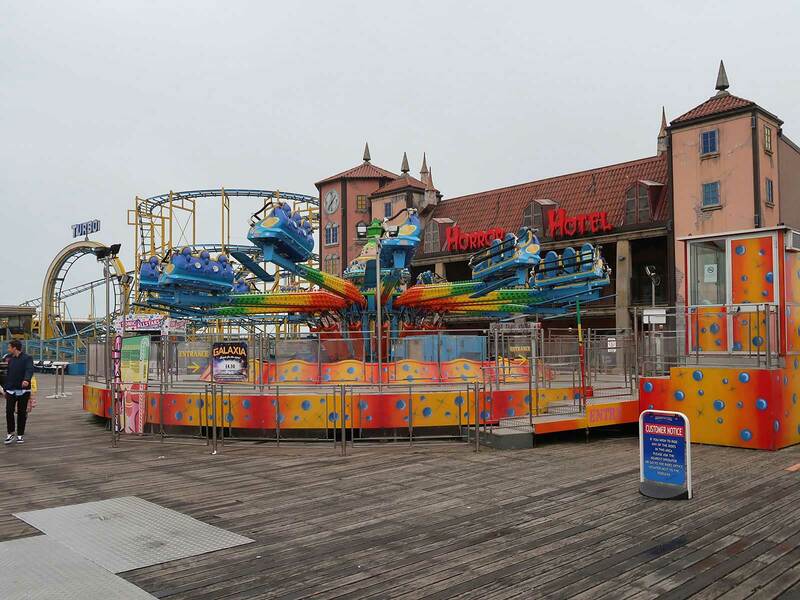 The task proved to be a lot more complicated than expected, in part due to changed health and safety requirements, causing the ride to miss its planned opening date. It took four interminable months before the authorities were happy and the trains began to roll again in the presence of local dignitaries. The park reopened with almost twenty attractions, including the Counter Culture Caterpillar, a standard layout Big Apple imported from Bulgaria. 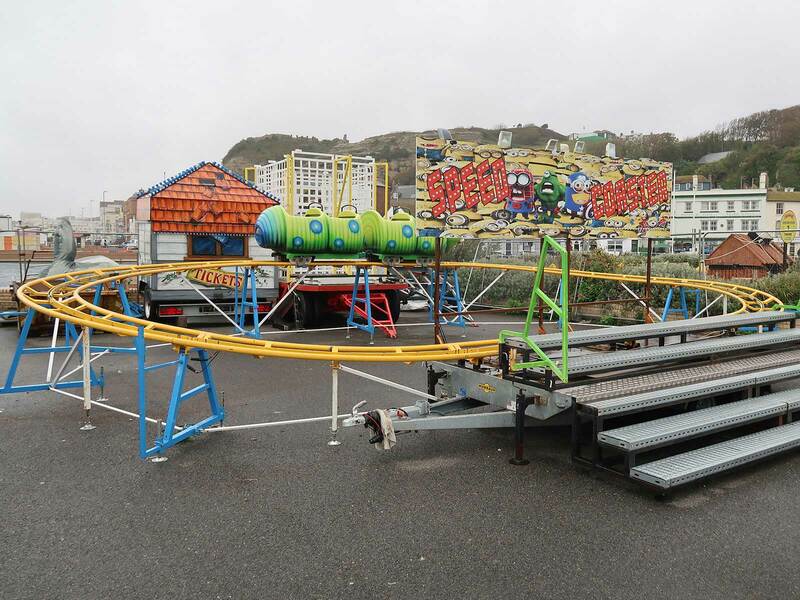 Despite its evident popularity the ride was missing during the 2016 season, though the delightfully misspelled Happy Caterpiller was brought in to replace it on a temporary basis. The original hardware has since been refurbished, rethemed, and reinstalled in a prime spot beside one of the ticket booths, and as we were walking past it anyway we elected to start our visit there. The newly renamed Beehive Coaster (#2389) looked nice, but our brief indulgence in melittology proved largely forgettable thanks to a ride experience far weaker than the one earlier in the day. There were only a handful of people in line to ride the Scenic Railway when we approached, allowing us to take seats in car five directly in front of the brakeman. It was immediately evident that the experience wasn't going to be as liberating as I remembered; each seat had its own ratcheting shoulder belt to supplement the shared lap bar, and there were large and ugly metal plates on the back corners of each vehicle that seriously restricted the view from anywhere other than row one. The restraints were easy to forget, but the plates had a huge impact on the overall enjoyment factor, to the point that I found myself cursing the nameless troglodyte who decided to add them. The ride layout is simple, consisting of two circuits around the same basic layout, the second being marginally faster than the first. Each section begins with a cable lift and a double-down drop, followed by an extended turnaround and two decent drops that go all the way to ground level. The second circuit concludes with some tight turns that can be either weak or forceful depending on the whim of the brakeman. Over the course of the afternoon we enjoyed a total of five laps, including both front and back. The latter delivered some good airtime, though it was considerably bouncier than the front and not something we'd have wanted to repeat without a break. The third coaster in the park at present is Magic Mouse, a spinning mouse ride relocated to the park this year from Fantasy Island in Skegness. The ride is the only example of the genre I've come across with individual seat belts, a bizarre addition given that there must be at least one hundred versions of the ride worldwide (including several in the United Kingdom) that operate without them. They had no impact on the ride experience, but they definitely reduced throughput as they had to be manually checked. Throughput was further reduced today by Japanese loading policies; for reasons best known to themselves the operators were loading every car in the station, dispatching them all at minimum interval, then waiting for all to return before repeating the process. On the positive side we enjoyed some extremely powerful spinning, to the point that we were both dizzy when our car came to a halt. One novelty of our visit was the Brookland Speedway, currently the only attraction of its type in operation worldwide. The ride looks at first glance like a set of dodgems, but there's a key difference; power is delivered using insulated tracks in the floor instead of through an overhead mesh. Bumping is forbidden, though today it was happening anyway despite the best efforts of drivers, as the vehicles do not have brakes. 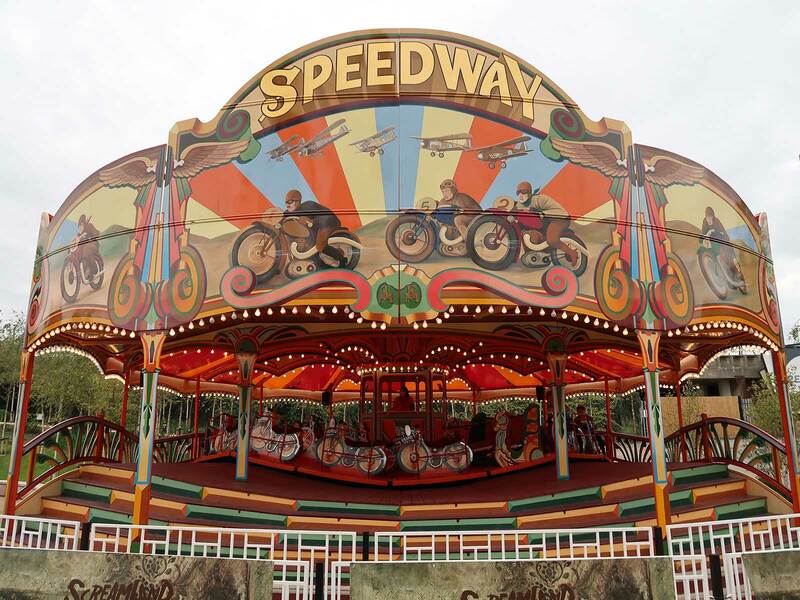 Our ride began with several stints lasting no more than ten seconds as various riders got into trouble, but even when we did get a decent stretch the experience was fairly dull, perhaps explaining why the genre has died out in the intervening years. We took a quick ride on the Big Wheel for photographs before heading to another Speedway, in this case a 1934 flat from Orton & Spooner featuring miniature motorcycles and chariots on an undulating base akin to that seen on modern waltzers. We decided to go with the plush cushions of a chariot for comfort reasons, though we quickly realised that it was necessary to lean forward as the padding was nowhere near sufficient to absorb the vibrations of the drive motor. Our ride lasted almost five minutes, which in all honesty was about four minutes more than we needed.